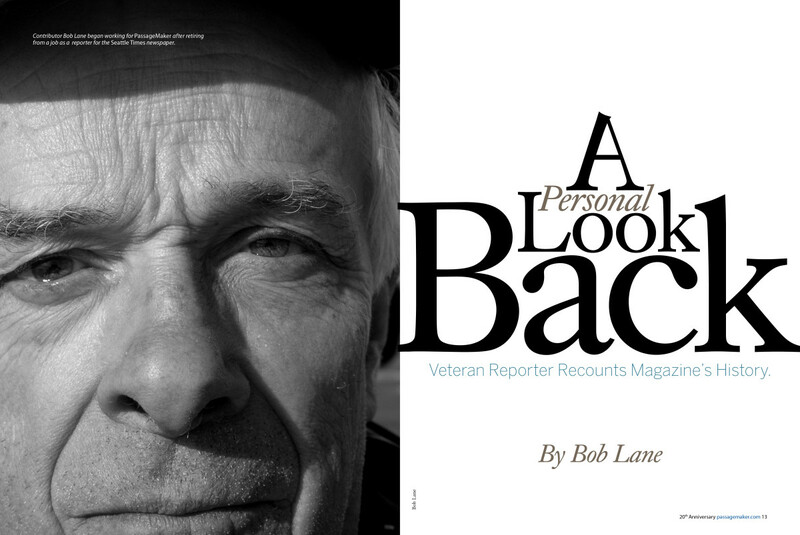 With one eye to the future, Bob Lane, our veteran reporter and long-time contributor takes a life-spanning and heartfelt look back at 20 years of PassageMaker. There I was, an unemployed newspaper reporter, hobnobbing on Seattle’s waterfront with a crowd of folks who, like me, owned and cruised Grand Banks yachts. A friend interrupted our sea stories to report that a woman was on the dock promoting a new boating magazine. My friend thought I needed to get back to work and hinted that writing for a boating rag might be fun and financially rewarding. That was in September, 1995, and my friend was more or less on the mark. A little farther down the dock was Alice Doggett, a West Coast representative for Bill and Laurene Parlatore, a couple of business-world types who were working in the basement of their home in Basking Ridge, New Jersey, with an audacious goal—creation of a new magazine with a special emphasis on cruising under power. We chatted. Bob embodied the spirit of PassageMaker and its audience; cruising the Pacific North West on his beloved GrandBanks 42, Quadra. The magazine would focus on trawlers and ocean cruising as envisioned by Robert Beebe in his book, Voyaging Under Power. 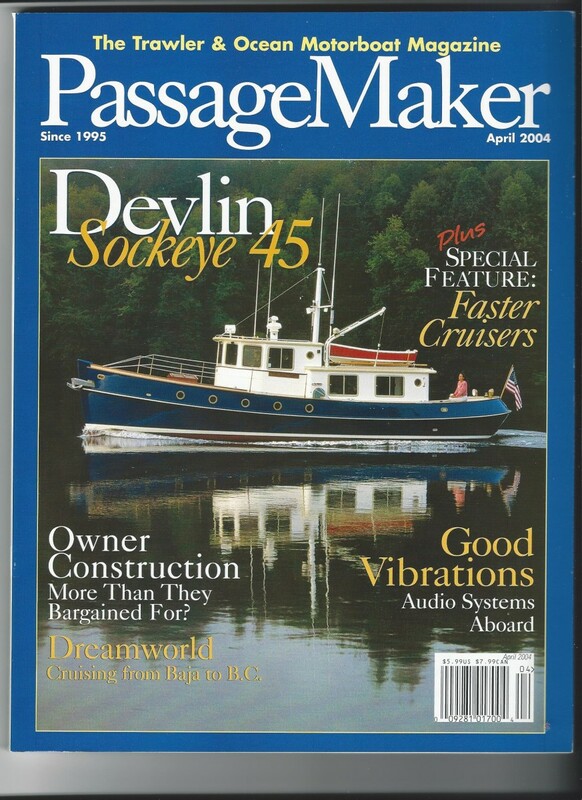 It would be called PassageMaker and its planners intended it to be different in the world of boating publications. That intent was emphasized by the subtitle Bill and Laurene introduced in the first issue: The Trawler & Ocean Motorboat Magazine. It’s now obvious that Bill and Laurene had a good idea. This year the magazine founded in that basement workroom will celebrate its 20th anniversary of publication. Their thoughts of publishing a boating magazine began to jell during an earlier trip south along the East Coast to Florida in the company of friends. That journey (on a motorcycle) included visiting a lot of marinas, which led to the realization that popular boating magazines gave little attention to full- and semi-displacement boats, many with a single engine, that could safely cross oceans or cruise challenging coastal routes to southeastern Alaska, the Panama Canal, the Caribbean, the Sea of Cortes in Mexico and other distant destinations. 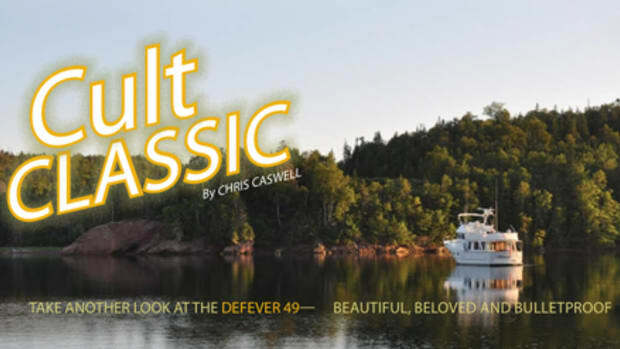 Alice, who wrote the cover story for the first issue featuring Amante, a 58-foot custom Delta, reeled me in and a few days later Bill and I were on the phone discussing the potential of an article about cruising to southeastern Alaska. It was published in the fall 1996 issue, the third PassageMaker in a quarterly publication schedule. It was the first of scores of stories I would write for the magazine. And, like many articles in the early years of PassageMaker, it was huge—12 pages of story, with 13 photos and maps. What was the first issue like? First, it bore no publication date, only the words Premier Issue. Bill and Laurene displayed an early version of the front cover at a boat show in Annapolis in late 1995, and, as I recall, Alice had a similar mockup in hand when I met her earlier in Seattle. The first issue came together after that and it has been considered a 1996 debut. As this cover shows, PassageMaker took an unconventional approach to its subject matter, and the readers loved it. The cover proclaimed “The Trawler Phenomenon — It’s Time Has Come.” A dramatic photo by Neil Rabinowitz showed Amante charging bow-on off the cover page. As editor, Bill featured in that premier issue articles by people who knew a lot about cruising under power: George Beuhler, a Whidbey Island yacht designer who gained fame for his ocean-capable Diesel Duck, and Jim Leishman, builder of Nordhavn yachts, craft also capable of long crossings, who wrote about the circumnavigation of Salvation II, a 46 owned by Jim and Susy Sink. It’s good to know that despite the weakened state of boatbuilding and sales that Beuhler and Leishman and Rabinowitz are still kicking in the business. 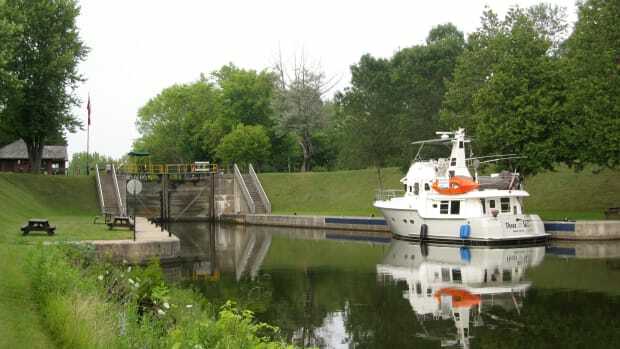 Other articles featured fuel filtering (See Unfinished Business on page 36), use of a drogue, keeping fit while cruising, a review of a new Nova Scotia-built 36-foot Monk and the advantages of a keel cooling system. With that issue, Bill introduced Sacha, a cartoonist whose smile-inducing and sometimes needling work appeared in the back of the magazine for years. As I learned quickly, long stories didn’t bother Bill. As a Seattle Times reporter I nearly always had a word limit imposed by editors, but Bill said, “Tell the story, tell people what they need to know.” I adapted quickly. The Parlatores may have made a splash with the first issue in late 1995, but it didn’t make them rich. Counting the front and back covers, the magazine, then a quarterly, offered readers only 68 pages. It had about 12 pages of advertising purchased by 16 firms willing to take a chance on the newcomer. It was a skinny start. In the beginning the magazine was a lot of hard work for the couple. While Bill dealt with writers, did editing and tended to the content, Laurene displayed her strong business skills in dealing with potential advertisers, managed billing and subscriptions and negotiated with printers. It grew as readers were attracted by the magazine’s theme and by Bill’s intent to cover an array of topics, not just new boats. Before the financial crisis of 2008 staggered the boating world, PassageMaker had become a bi-monthly and was offering readers 240 pages or more of content in each issue. With the nation’s economic woes stifling business, the magazine quickly shucked about 100 pages of content as advertising sales declined. A few months after my waterfront meeting with Alice, Bill and Laurene came to Seattle for a boat show, carrying page proofs of my epic-length Alaska story. The magazine’s dramatic and generous use of color really impressed me, and I was totally overwhelmed at dinner in a Lake Union restaurant when they asked me to become a contributing editor. I said yes. I wrote my first story on a Compaq “portable” PC. (It probably weighed 30 pounds.) Its operating system was on a CD that had to be inserted on every startup. The article was printed on a dot matrix printer and the copy and sleeves of 35mm pix were put in an envelope and taken to the post office. Today I can do it all with one finger. The Parlatores hired their first full-time employees in 1998. Among them was Kieran Conaty, whom I remember as a strong youngster who set up show displays. He’s now an advertising sales associate. Several years later Geoff Leech came aboard; today he’s the magazine’s associate publisher. Bill brought passion to the magazine. It held up, too, even though it took time for the industry to recognize his efforts, simply because what he and Laurene were doing was unique in the market. No other magazine, he would note, published stories that went to similar lengths to inform readers and to tell a full story on a huge variety of topics associated with cruising under power. Bill has said that for him it was a magic time. In 2005, with the magazine producing 270-page issues and offering its popular TrawlerFest boat show program, the Parlatores sold to Trader Publications, which then published more than 700 titles. Trader was owned by two other communications giants—Cox Enterprises and Landmark Communications, owners of cable TV stations and the Weather Channel. Bill continued as editor-in-chief for several more years and later the company name on the masthead was changed to Dominion. Active Interest Media (AIM), a giant corporation that owns other marine publications and a slew of niche, or special-interest, magazines, acquired the magazine in 2011, when dropping economic tides had reduced it to about 130 pages per issue. My last count on the corporate website showed AIM owning 54 publications covering everything from equine activities to healthful living and home and outdoor activities. It owns a flotilla of other boating publications—SAIL, Soundings, Trade Only Today, Power & Motoryacht, and YachtsInternational—as well as Show Management, the brain and brawn behind several boat shows. 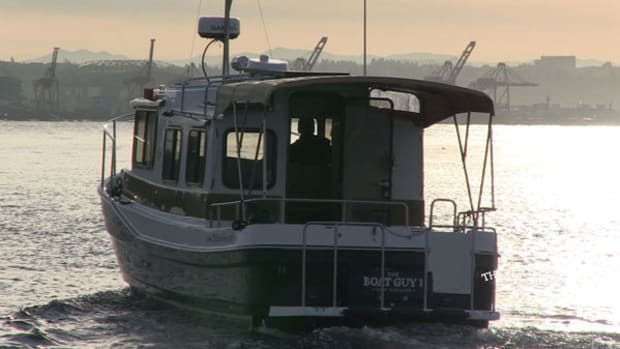 Like many readers, Bob was a very hands-on boat owner. 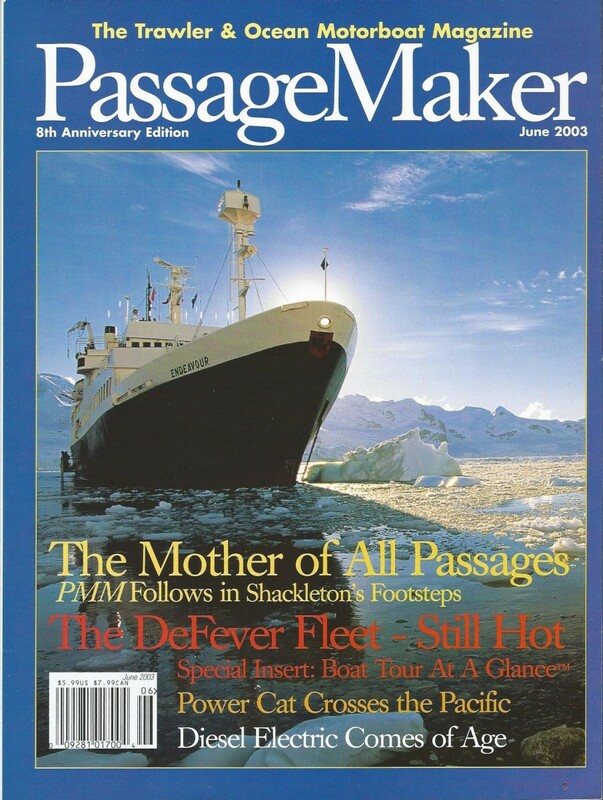 I split from AIM and PassageMaker for about a year because of significant policy disagreements with a former editor-in-chief who, I believe, thought the magazine’s only significant role was to support the business of building and selling boats and to get advertising in return. My view was (and still is) that our responsibility is to readers looking for information. If we do that job well advertisers will flock to a publication because they recognize it has plenty of readers happy with objective reporting. 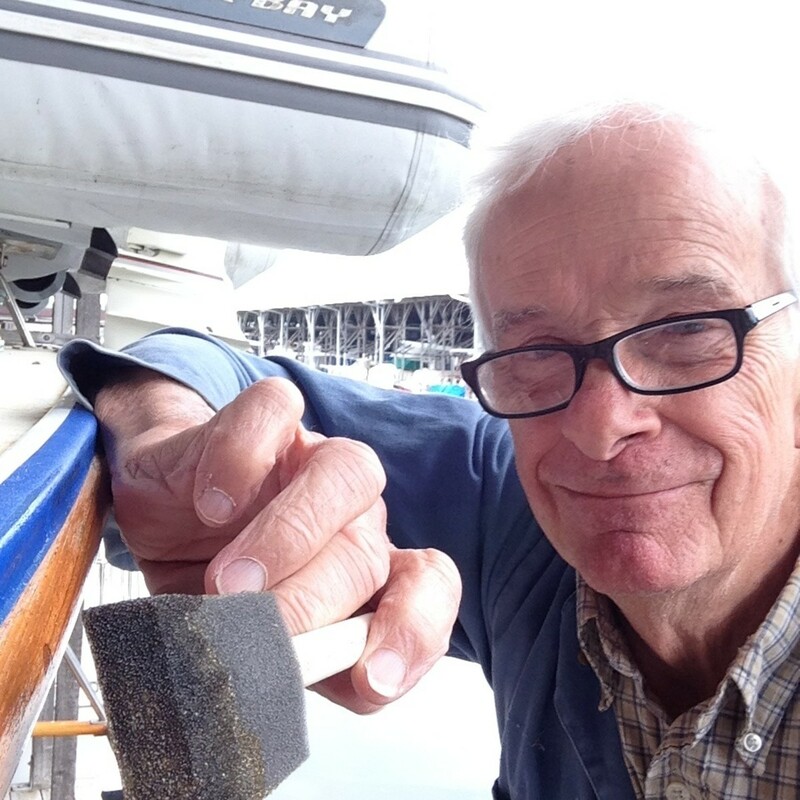 In spite of this change in the tag line, PassageMaker remained true to Bill’s mission: if a new boat being inspected had wonky wiring or some other nautical equivalent of clay feet we would report same, but only after asking the builder the reason for the flaw. After checking out a new boat, Bill told the builder the saloon settee was too short for sleeping and explained that during rough weather under way the settee was a better bed than a berth in the bow. The builder was grateful and changed the design. And then there was the time that a builder—who had read reviews with intelligent suggestions—invited a bunch of PassageMaker folks into the back room at the Seattle Boat Show and asked us to review plans for a new boat. To give authority to any review of cruising under power, Bill welcomed stories from boaters that described voyages, destinations and adventures. Some of the most dramatic were by veterans of global exploration under power. A notable example is the work of Denis and Mary Umstot, whose ocean odysseys took place aboard a Beebe Passagemaker named Teka III. The Umstots logged more than 60,000 nm and proved that Beebe was right about the potential for cruising under power. Along the way, Mary wrote 13 articles for PassageMaker (with occasional assistance from Denis) and the book Voyaging to the Mediterranean Under Power. Later, she was asked to revise Beebe’s 1975 book (already revised once by Leishman and Nordhavn), but she passed the offer to Denis. Having written extensively, including a book, he knew it would be a challenge but he felt ready to share experiences and knowledge. My office bookshelf features all three versions, beginning with a first edition of Beebe’s original. I was involved in another exciting example of adventurous ocean cruising, but only from a distance as a writer. Sprague Theobald, owner of a 57-foot Nordhavn, took on the dangerous expedition of crossing the Northwest Passage from east to west, from his home in Newport, Rhode Island, to Seattle, Washington. He knew the history, particularly the disappearance in 1848 of two British sailing vessels, Erebus and Terror, under the command of Sir John Franklin. The ships froze in the ice near the top of the world and 129 crew members died of starvation, exposure and disease. That must have been in his mind when Bagan became stuck in the ice, with family part of the crew. “I was so past frightened,” he told me much later. Using both engines and the vessel’s bulbous bow as a ram, he and the crew were able to free Bagan and inch the yacht to open water. But not everything we did was high-seas dramatic. I, and other writers, covered the waterfront to bring all aspects of boating into the PassageMaker tent. Sally Bee Brown wrote especially well about people in boating, including some who restored old British Columbia forestry boats and a woman who starred in the male-dominated world of surveying. Sally and her husband, Charlie, were experienced Northwest boaters. Bob has appeared in the magazine throughout its entire span. Steve D’Antonio, whose first job in the boating industry was repairing outboard motors, became the technical editor. He wrote extensively about systems and how they should work, he toured boats for stories and no problem eluded him. His columns were popular because he was willing to answer seemingly countless and sincere queries and to help solve problems. His sharp eye, however, likely made him unpopular with some builders and dealers. Yes, this is all past tense. Steve and PassageMaker have split, though he will still appear in its pages and online. PassageMaker readers likely will miss him. On the other hand, highly qualified contributors will carry on. Nigel Calder is technical editor and Ben Ellison is senior electronics editor. Writers with extensive publication credits and nautical knowledge also appear on the masthead, including Richard Thiel, Chris Caswell and Steve Zimmerman. 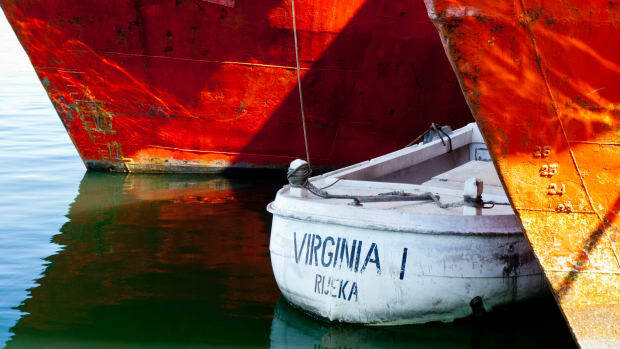 I wrote several stories about backyard-built craft, including a steel yacht assembled in a shed in a California vineyard that turned out beautifully and, the last time I looked, was for sale in Anacortes. Named Sonata, she was the only yacht I have known with the main engine encased in a soundproof cabinet. And, yes, Sonata was a quiet boat under way. She also was the first yacht in my experience to have a digital network reporting temperatures, tank capacity, and a lot of other performance characteristics to the helm. My credits also would include stories about the first all-aluminum yachts built in the Northwest. One of them, Sea Buggy, still does charter runs to Alaska from her base in Anacortes. 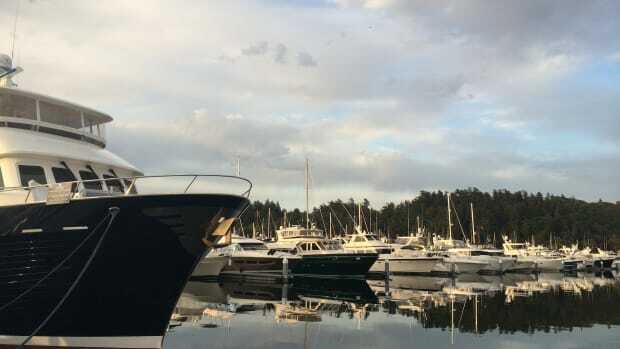 Another story important for lessons learned was a report on the sinking of a yacht in Puget Sound as a couple made a bad decision and raced through stormy weather for medical help. In the early years of the magazine my wife, Polly, helped writers, particularly amateurs; get stories in shape for publication. After retiring from the Seattle Times as an aerospace and business writer she became a copy editor for the magazine. Her office was one floor above mine in our Burrows Bay home and I often could hear her on the phone helping amateur writers develop a story by identifying a theme and developing a structure, while not changing what they wanted to say. Steve D’Antonio was among those she helped. Her last contribution was as a writer. 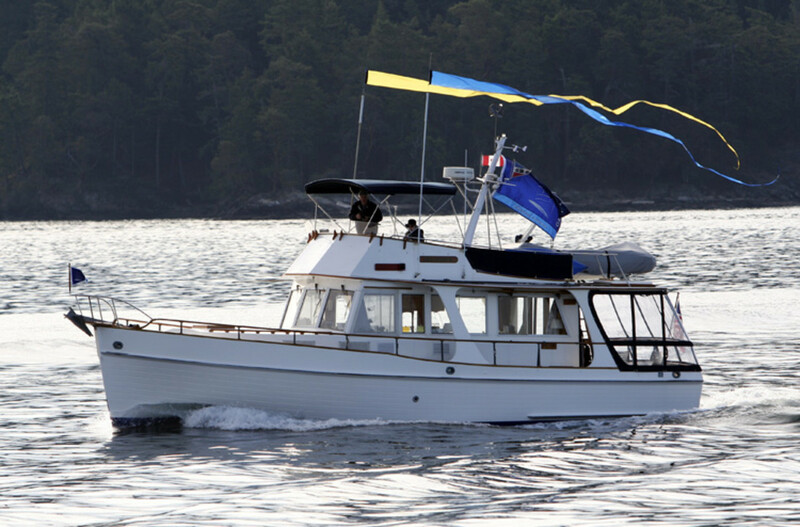 She and I joined a Grand Banks rally to Southeast Alaska in 2006 to celebrate 50 years of boat building by GB and together wrote the concluding article about that tour of 15 boats. She died of cancer early in 2007. As well as being editor and publisher, Bill and Laurene also were friends. After Polly’s death they worked to keep me busy. It wasn’t obvious then, but today I’m positive that was their intent. Bill had lots of assignments for me, I was sent to distant boat shows just to soak up information and to hang out with staffers who were like family and given plenty of writing assignments. I am grateful. 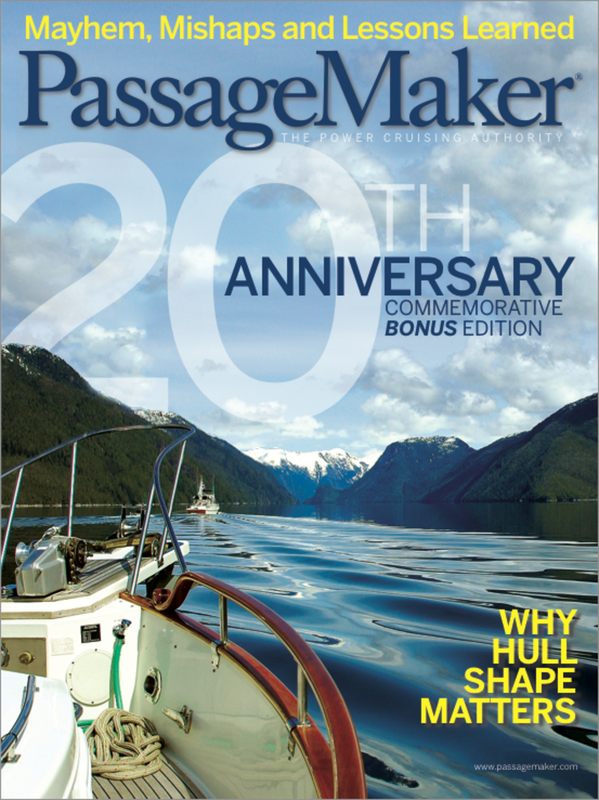 Personally speaking, PassageMaker’s 20 years have been exciting, challenging, frustrating and rewarding (and I’m not talking dollars here) and I thank my Grand Banks friend for giving me a push and Bill and Laurene for making it happen. What will the next 20 be like? I’m hoping the magazine’s roots will not be lost. Let’s find out together. Bob Lane passed in February of 2015, just after the magazine&apos;s 20th anniversary edition was received by subscribers. Click here to read PassageMaker&apos;s remembrance of Bob Lane.